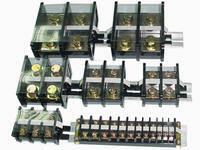 Shining TA series DIN Rail assembly terminal blocks include TA-010~TA-400. Rated voltage/current:600V/10A~400A. DIN Rail:35mm. Assembly for any poles. Protective Cover is optional for the alternative of Transparent Cover.